The 2015 VASA Wire & Gas convention was a big hit among delegates, sponsors and exhibitors. Attendees agreed that Barbara H Minor’s R1234yf presentation caused a real buzz, was a highlight of the event and a great way to kick off proceedings. 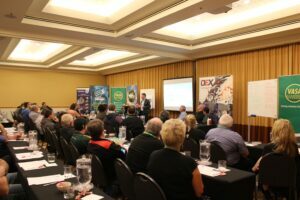 The high quality, content and engaging delivery of the five training sessions also received particularly high praise, as did the informal networking opportunities around the trade show area and the professionalism of the functions. VASA would like to thank all delegates for making it such a great event, the sponsors and exhibitors for their much appreciated support, the trainers and the speech-makers for sharing their knowledge, and the event volunteers and staff for ensuring it all ran smoothly.